There was a sense of anticipation as the two snow coaches pulled up outside our lodge in West Yellowstone. Another significant overnight snowfall blanketed the ground and flurries of large, soft flakes still danced in the air. There was a lovely, pleasing crunch under foot. The previous four days in Yellowstone had already been very good, in some ways providing a hors d’oevre for what was to follow. Initially concentrating on the park’s northern ranges we had followed the road from Gardiner to Mammoth to the Lamar Valley (the only road that is kept open for regular vehicles in the winter), and had seen plenty to keep interest levels high – bison sparring, coyotes hunting, a moose browsing, bighorn sheep grazing on steep cliffs and even a pack of wolves feeding on an elk they had brought down the previous day (albeit at some distance through a scope). Yet as the giant caterpillar tracks of the snow coaches rolled and we re-entered the park at the West Entrance, there was a sense that this is where the trip would begin for real. We trundled along the compacted frozen road that follows the course of the Madison River, as snow clouds gave way to hazy, watery sunlight. In the river’s icy waters we came across groups of common and Barrow’s goldeneyes and the occasional common merganser. Then a magnificent bull elk was seen wading across the river and it stopped to feed on bank side vegetation and provided our first obvious photo opportunity of the day. We’d been given a tip off that it was worth spending time searching the banks of the Madison in the area as one or more bobcats had been showing themselves. These cats are normally remarkably elusive and good sightings are rare and fleeting, yet a cameraman working for the BBC had been successful in getting some excellent footage, so we were quietly hopeful. On our first drive up river from Seven Mile Bridge to Madison Junction we drew a blank. We bumped into the cameraman who told us he’d seen a cat early morning but subsequently nothing. So at Madison Junction we turned around and re-traced our route, heading downstream. 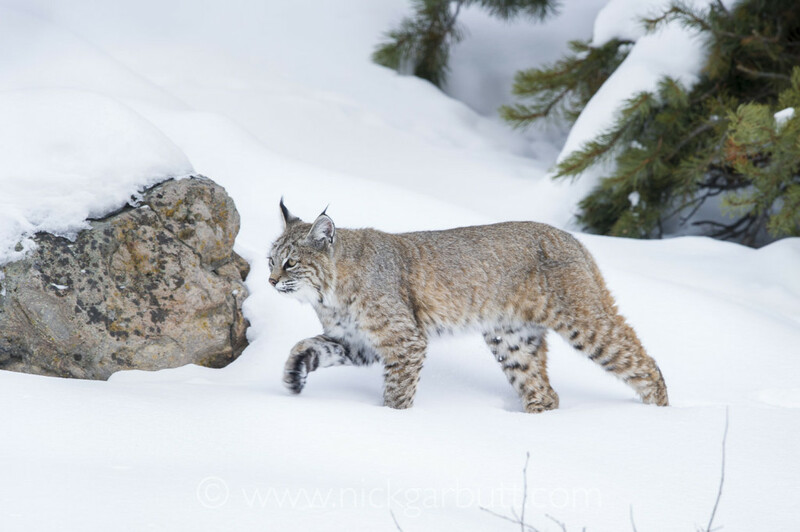 Less than a mile back down the road, we found the bobcat – incredibly crossing the road in front of us, and pushing through deep snow down to the edge of the river. So we pulled well ahead and got into position to wait for the cat as it walked towards us. It was a short wait. 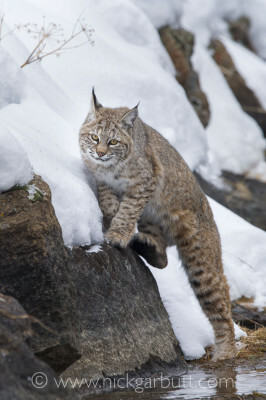 No sooner had we set up and the bobcat rounded the bend in the river and gradually picked its way along the water’s edge, moving from boulder to boulder and occasionally through snow. It appeared completely unperturbed, finally stopping a handful of meters away to take note of the small gallery of photographers paying it such close attention. We backed off to give the bobcat space and it nonchalantly climbed up the bank and walked back across the road to climb up through the wooded slopes on the opposite side. Intuitively, I though that was the last we would see of it. I was wrong. Instead the cat seemed happy enough to traverse across the snowy slopes just above us and in full view, clambering over occasional fallen logs and debris, before dropping back down towards the river. The photo opportunities from that very intense fifteen minutes were incredible. At the start of the day anyone in the group would have settled for a single decent shot of a bobcat, but by the end of this amazing encounter everyone had dozens. To an extent this set to tone for the remainder of the trip: each day there seemed to be one or more encounters or occurrences prompting evening conversations where “weren’t we so lucky” cropped up time and again. After the bobcat rendezvous, we continued on to the Upper Geyser Basin and the Old Faithful area: three nights here gave us plenty of time to explore the Firehole River Valley and the various geyser basins and other geothermal features that characterize and define the area. In winter this is an ‘other worldly’ place where snow and ice is juxtaposed with cauldrons of boiling mud, super-heated water rocketing towards the sky and swirling stream clouds. 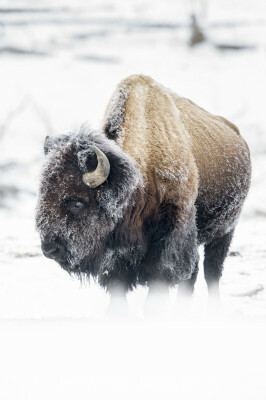 This is the best place to see frost encrusted bison – when the night time temperatures plummet (sometimes to -30.C) the bison gather around the hot springs and steam freezes onto their faces and coats. 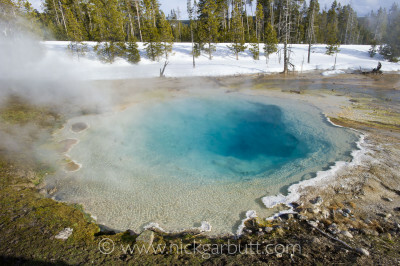 The area between Upper and Lower Geyser Basins, along the Firehole River contains many of the Park’s most famous geothermal features: Morning Glory Pool, Grand Prismatic Spring, Fountain Paint Pot, Excelsior Geyser and of course Old Faithful Geyser. An early morning drive gave us a real appreciation of this. At every turn, plumes of steam rose into the frigid air and where these swirled around adjacent lodge pole pines, the trees became cloaked in spectacular frosts and sculptural ice formations. In one area where historic earth movements had caused a forest area to flood with hot water, the dead trees stood in regimented ghost-like formations emerging from cold mists. Being fed continuously by hot water from the countless boiling springs, the Firehole River itself remains unfrozen, and in places its actually warm enough to bathe in (if you’re brave enough). Many waterfowl take advantage and we also saw numerous American dippers, bobbing on rocks and plunging into the tumbling waters to forage. For the final, and perhaps most exciting part of the trip, we again travelled by snow coach, this time from the Old Faithful Area, back to Madison Junction, on through Gibbon Meadows to Norris Geyser Basin and then ultimately to the very interior of the park at the Grand Canyon of the Yellowstone, where the Yurt Camp is situated that would be home for the next four nights. The camp is tucked away in the forest – most people have no idea it is there. At around 2420m (8000ft) this central area is more than 330m (1000ft) higher in elevation, than any of the other parts of the park we had visited: the snow is noticeably deeper, and average temperatures are much colder. The beauty of staying at the Yurt Camp is not only that it allows access to some of the most spectacular parts of Yellowstone, but also that it provides unprecedented solitude. In the winter, there is nowhere else to stay in the area (the nearest alternative accommodation is 40 miles away: Old Faithful Snow Lodge or Mammoth Hot Springs Lodge), which guarantees having the place to your self (other than in the middle of the day, when day trip traffic briefly reaches the area). During our first night, the skies cleared and we woke to blue sky, a significant drop in temperature and very heavy frost. Our Plan A was to drive the short distance to the Hayden Valley, where the upper Yellowstone River winds through an open expanse of rolling hills. 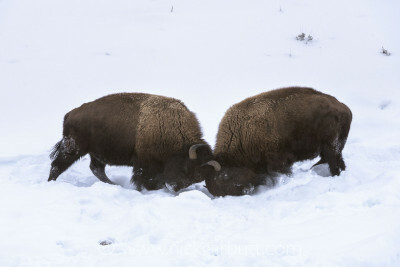 It is one of the best wildlife hot spots in the park. 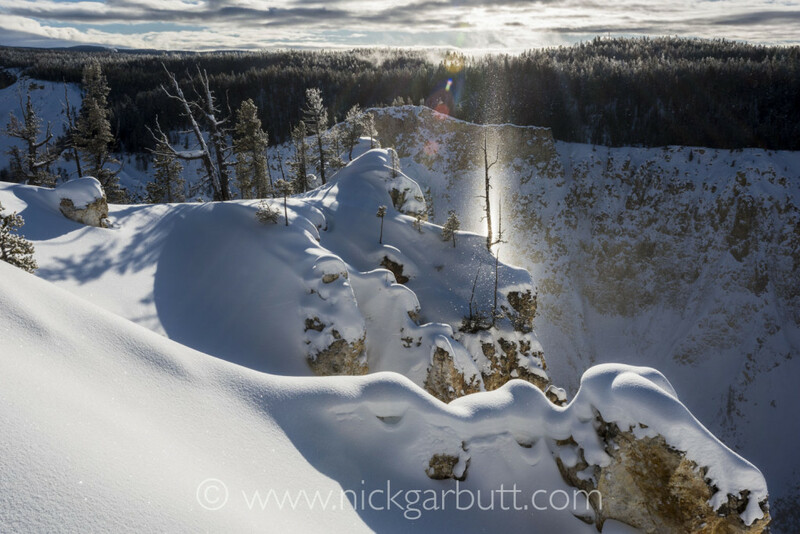 But shortly after leaving camp, Elijah, one of our excellent Yellowstone guides, suggested we immediately go straight down to the north rim of the Grand Canyon of the Yellowstone because conditions might just be right to see ‘the beam’. 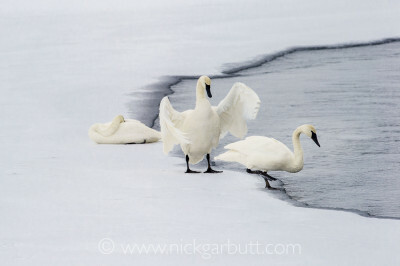 This is a phenomenon that few have witnessed and was famously photographed for the front cover of a National Geographic edition about Yellowstone. A rather specific set of conditions have to fall into place, but when the temperature is right (very cold i.e. below -20°C), and there is little or no wind, spray from the still flowing portion of Yellowstone Falls, instantly freezes into tiny ice crystals that hang in the air, then if the angle of the sun rising over the horizon is correct, the light catches these crystals that show up like you would imagine fairy dust to be, and an amazing beam is created from the sky. On four previous winter trips to Yellowstone I’d failed to see it. Following Elijah’s advice we diverted to the Canyon rim and one of the viewpoints overlooking the monumental gorge that has been gouged by the waters of the river. As we approached the rim, the sun began to peak through the few clouds that clung to the horizon. It looked very promising. 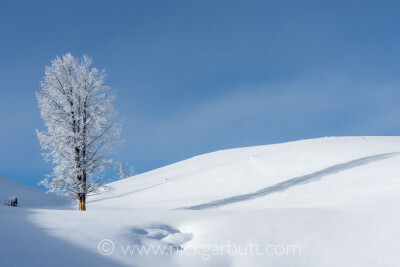 By the time we had walked the short distance from the snow coach to the view point, the sun had completely forced its way through and in an instant the beam appeared – a remarkable shaft of spangled golden light spearing down from the sky and illuminating a particular statuesque tree on the Canyon rim. It was magical. I’ve since learned the phenomenon is called a sun or light pillar. We then spent most of the remainder of the day scouring the Hayden Valley, principally looking for red foxes and with some success. 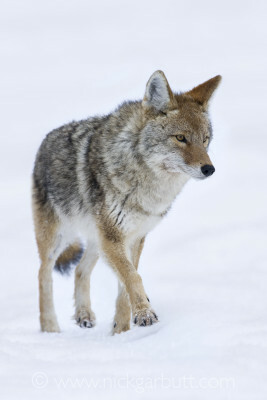 There are fewer coyotes in the area and during the winter the wolves move elsewhere in the park (because their elk prey migrate to lower ground), so the fox population in the valley thrives. The snow is deep and the foxes’ principle hunting strategy is to listen for rodents moving around in the labyrinth of tunnels they create beneath, before diving head-long into the snow in search of a meal. 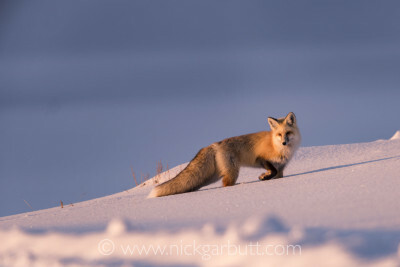 On that first day in the Hayden Valley we witnessed numerous attempts, some successful, some not, from at least three different foxes (after three full days in the valley we suspected we had seen six to eight different individuals). The icing on the cake was the final sighting of the day. In the late afternoon a rich sunset developed and intensified. We had been watching a particular fox for some time as it explored and searched expanses of snow covered meadow close to the road. As the stunning pink alpenglow reached its climax, the fox trotted up the bank towards us and began one last late-afternoon hunt in full view only a stone’s throw away from where we watched. It paused, looked intensely at a spot in the snow and cocked its head. Was there is rodent meal beneath? Back at the Yurt Camp, Connie, the superb camp cook (and Grammy award-winning singer), suggested we might go back down to the Canyon overlook after dark, as a full moon was due to rise around 7.45pm. After an early dinner feast, we wrapped ourselves up against the chill (it was already -23°C and falling) and jumped back in the snow coaches for the short drive. The sky was completely clear and with no light pollution, the inky blue-black above was filling with a myriad of twinkling stars. When we arrived at the north rim of the Canyon, there wasn’t a breath of wind and the first light from the rising moon was emerging over the opposite side. The stillness was eerie. As the moon rose further, and light reflected off the snow-cloaked landscape, more and more detail in the Canyon became visible. A moon beam appeared. The lunar equivalent of the sun pillar we had seen in the morning. It looked like a scene from a sci-fi movie, with aliens about to beam down to earth from the blackness of space. The sight was spell-binding. 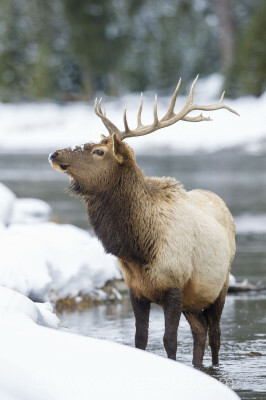 None of the staff from camp had previously seen the phenomenon (nor were they even aware of its existence) and later discussions with other winter park staff, who have worked in Yellowstone for years, revealed a general ignorance. Everyone knew of the sun pillar but not the lunar equivalent. We pondered, surely someone had seen it before but had anyone ever taken a photo? It was hard to imagine how our first full day at Camp could have been better. And how could we follow it up? We certainly gave it a go. 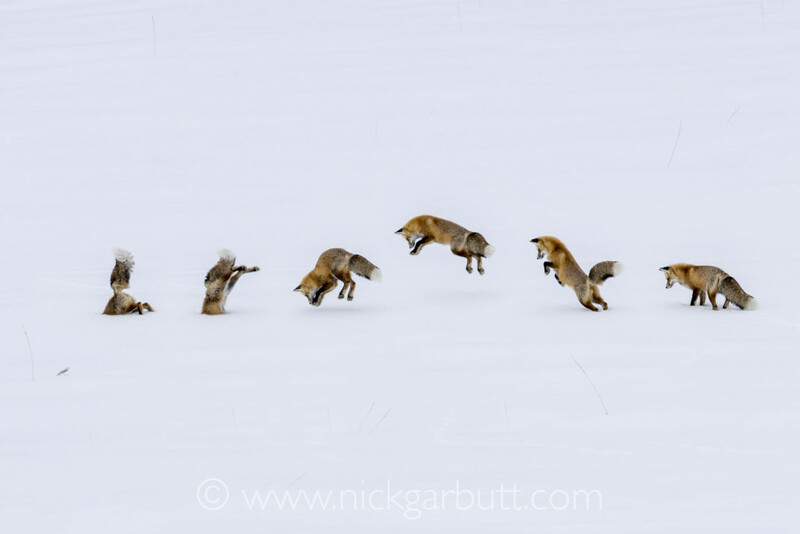 Perhaps the exhilaration of that day was not quite matched again, but we were able to fill in several gaps, including numerous further occasions watching red foxes hunting for rodents. There were also really good views of a beaver and a pair of otters. 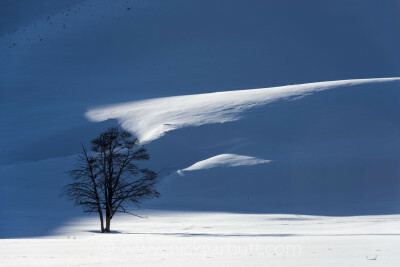 But perhaps the aspect we all enjoyed and reveled in most, was the solitude and stillness and pristine beauty of the snow-cloaked landscape. Imagine a giant undulating cake covered in brilliant white fondant icing and you will be somewhere close to the spectacle of the Hayden Valley in the depths of winter. On our last full day in Yellowstone, we spent the morning in the Hayden Valley, before backtracking in the snow coaches to Madison Junction, so as to spend our last afternoon along the Madison River. There was (of course) one last surprise – another bobcat. 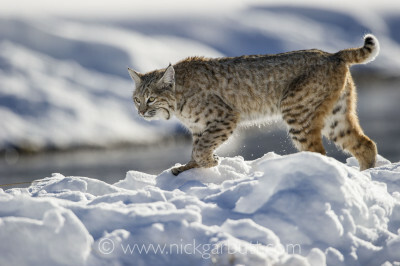 It was initially seen quite away from the road, walking close to a large meander in the river, but the cat seemed to be resolutely working its way upstream, so we moved well ahead of it, to where a bend in the river came close to a pull out and waited. Five minutes later it appeared and wandered right by us, seemingly without a care. Dare I say, perhaps the ‘purrfect’ end to a superb trip. Many thanks to Elijah, Alice, James, Audrey, Connie, Kayla, Erica and Arden for all their hard work and help. Find out more about the next winter trip to Yellowstone in 2018.